Hair loss in women is far more complex than in men and it is often found that women have more than one reason for hair loss. By age 50, about 30% of women have genetic hair loss, sometimes known as ‘female pattern hair loss.’ Female pattern hair loss is more common than generally appreciated. Hair loss due to genetic factors starts in the center of the scalp and causes the central part width to become more visible. Treatments for genetic hair loss in women include topical minoxidil, oral hormone blocking medications and hair transplantation. In addition to genetic hair loss, other reasons for hair loss are also common in women. Many women have excessive hair shedding and this may occur from thyroid abnormalities, low iron new medications in addition to dozens of other reasons too. Women with hair shedding issues require a full evaluation by a dermatologist to determine the precise cause. 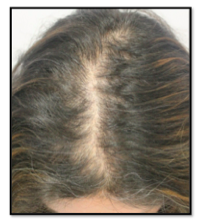 Autoimmune scalp conditions leading to scarring or non-scarring hair loss are also more common in women than men.